Shakespeare's tragedy, Macbeth, is a cautionary political tale in which assassination, terror, and civil war feature prominently. Macbeth gains the throne of Scotland through naked violence, and soon loses both power and his life in an equally violent fashion. The play is not, however, an argument for pacificism. Instead, it warns its audience about the horrors unleashed when powerful people, with the instruments of violence at their disposal, lose touch with their own principles. Counterinsurgency is just as much a narrative about violence as Shakespeare's play. Those fighting guerrillas often fail for the same reasons as Macbeth, who depended on violence alone to maintain power. Without legitimacy, not even the most ruthless measures could keep Macbeth on the throne. Unfortunately, without legitimacy, ruthlessness is all people in Macbeth's position have left. Failed revolutionaries and counterrevolutionaries alike have followed the same logic to its gruesome conclusion. When the burden of political murder becomes too great to bear for a society to bear, those in power build an even greater pile of new corpses—this time, the bodies of anyone who might have sided with the original victims—to keep the weight of outrage from crushing them. The Robespierres, Pinochets, and Pol Pots of history's great tragedies eventually reach one of two outcomes. Either they craft the machinery of political violence to the point where torture, terror, and execution outpace any possible resistance, or the whole enterprise collapses under the weight of collective guilt. There is, happily, more than one way to use violence to forward or counter revolution. Practitioners of counterinsurgency, the focus of this series of posts, can pursue two strategies, the "Stalinist" and "British" approaches. Adherents of both approaches have experienced successes and failures, so it is important to address them with equal seriousness. It is important to understand the nature of this choice, since there is no middle ground between them. Either you pursue legitimacy and security simultaneously, or you are left with a terrible alternative, the Stalinist approach. The Soviet state was successful at crushing insurgencies that threatened Moscow's control over the non-Russian republics. The stories of these rebellions, which stretched from the Baltic States through Central Asia, are not well-documented or well-understood in the West—a major reason, incidentally, that the thorough collapse of the Soviet Union took Western intelligence agencies by surprise. The secular Soviet regime fought its own bitter counterinsurgency war against Muslim opponents in "the Stans," Muslim-dominated regions such as Uzbekistan and Kazakhstan. 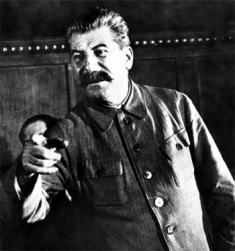 Stalin subjugated these populations through the most ruthless measures possible: mass deportation; mass starvation; the penetration of the police state into every aspect of people's lives; the spread of terror through imprisonment, torture, and execution; the erasure of any secular or religious institution separate from the Soviet party/state. As I discussed earlier, this approach worked only as long as the Soviet regime had the will or capacity to maintain it. With its economy in a shambles, the legitimacy of Communist rule eroded by oppression and corruption, Gorbachev's glasnost policies were a desperate stab at salvaging the Soviet regime. The client states of the Soviet external empire used the new "openness" as opportunity to defect, followed by the all the republics of the Soviet internal empire. 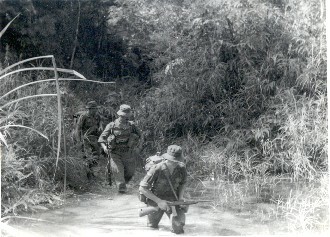 The British approach, which depends on the simultaneous advancement of political legitimacy and physical security, uses the British handling of the Malayan Emergency as its model. The men who headed this campaign, most prominently Lieutenant General Gerald Templer and Sir Robert Thompson, outlined their strategy in eloquent and compelling terms, which is why generations of counterinsurgency specialists have found inspiration in their example. The British convinced Malayans that the pledge to grant them independence was serious, nullifying the MRLA guerrillas' claim that they were fighting an inevitable conflict against imperialist overlords. At the same time, the government that would replace British colonial rule was representative of the ethnically diverse Malayan population, and it proved effective at governing. The new Malayan government was, in other words, something a lot more attractive than the "running dog lackeys of imperialism" of MRLA propaganda. Not only did Great Britain gracefully exit from Malaya, but it left behind an independent government, resting on a relatively solid foundation. The British had less success in other colonies, often where the colonial authorities tried to maintain control more through force than legitimacy. The ham-fisted efforts to quash Indian independence in the early 20th century, the Victorian misadventures in Afghanistan, and the catastrophic loss of the American colonies all stand in stark contrast to Britain's success in Malaya—and, therefore, makes the strategy used in the Malayan Emergency that much more credible. Before concluding this discussion of counterinsurgency, it is important to see the general guidelines in light of this important choice between the Stalinist and British approaches. Counterinsurgency is definitely "doable," but a great deal depends on how a country like the United States chooses to do it. It is entirely possible—and, in fact, necessary—to stick to one's principles while fighting a desperate struggle against tenacious, resourceful opponents. A good measure of the seriousness with which a great power approaches counterinsurgency is how it makes the organizational and political preparations for this kind of warfare. Although top decision-makers are used to having centralized, hierarchical control of military operations, counterinsurgency demands that they be willing to devolve control to the lower echelons of the military and civilian bureaucracies. At the same time, someone must be able to orchestrate all the military, intelligence, diplomatic, and economic assistance efforts, which is normally cannot be a person close at hand in great power's own capitol. Instead, the best person to put in charge is someone in the theater of operations, granted unusual powers across normal bureaucratic boundaries. In short, the campaign has to be led by someone other than usual military chiefs who plan and execute conventional military operations, a person uncomfortably far away from the capitol for any control freaks among the national leadership. While this approach to organizing and fighting a war may be unfamiliar to those versed in conventional warfare, a nation that believes in democratic and meritocratic principles constitutionally should have little difficulty embracing it. A society that produces self-governing citizens should, by extension, be able to devolve power, when needed, within the government itself. People who believe that government is an instrument created to serve its citizens should not be intimidated when civilian and military branches of that government need to be re-designed to handle particular exigencies. Just as automobile engineers figured out how to design vehicles that could operate in two-wheel and four-wheel drive, citizens and leaders can craft the institutions needed for both conventional war and its unconventional siblings, counterinsurgency and counterterrorism. They may need to exercise a bit of ingenuity to stay within constitutional and legal boundaries, but that is hardly an impossible enterprise. (In fact, argued later in this post, the principles behind the Constitution and the laws are a major source of strength.) Only tyrants fearful of upsetting their grip on power, or subjects who see the government as something greater than themselves, worry about re-engineering government to meet new challenges. A great power must be just as careful in its dealings with its allied regime, the target of the insurgency, since the great power is simultaneously supporting and undermining that ally. The incumbent regime is the preferred alternative to the guerrillas, or else there wouldn't be any counterinsurgency campaign at all. However, the regime has some serious problems claiming legitimacy or exercising control, or else a guerrilla movement would not exist. Walking this diplomatic tightrope with the besieged regime requires the freedom to shift political weight one way or another as needed. At the same time, the great power has to provide its ally with enough political latitude to make peace with the insurgents, but not in a way that threatens the great power's interests. The great power's domestic political constraints may render this joint balancing act impossible—which is why it's important for leaders to describe the conflict carefully. Declaring the insurgents to be the scions of ultimate evil closes off the negotiated path to victory. Lavishing praise on an allied government with obvious problems makes the alliance look entirely misconceived. At the same time, too much public rhetoric spent on these defects can complicate the working relationship with that ally. Again, a great power like the United States should not have a difficult time applying its own rhetoric about democracy to counterinsurgency—as long as Americans truly believe what they are saying. Adherents of democracy believe in the power, over time, to persuade those with whom they disagree, or finding some mutually acceptable compromise. In counterinsurgency, these targets of persuasion include both the guerrillas and the allied regime. The idea of persuading or compromising with insurgents should not be abhorrent to Americans, since a rebellion gave birth to the United States, the "first new nation." There may be particular opponents, or particular moments in an insurgency, when the door is closed to settlement. The hand that closes that door, however, should not be American. National leaders have to lay the correct political foundation within their own country for the great power's own war effort. Even the best-crafted counterinsurgency strategy will collapse without sufficient political support. National leaders have to define the conflict as being important enough to be a major participant without exaggerating its real significance or the prospects for victory. Leaders must be just as careful when discussing the time required, or the hard choices among morally and practically ambiguous options. In other words, leaders have to trust their citizens, which is a precondition of democracy in any situation. Counterinsurgency does not pose uniquely intractable problems or difficult choices. Citizens of a democracy face similar challenges dealing with health care, crime, abortion, obscenity, addictions to legal and illegal drugs, and a whole range of other issues. Counterinsurgency may seem unusually difficult only when compared to conventional warfare, for which most great powers like the United States are usually better prepared. The real test of a country's belief in its own principles happens when it chooses to see counterinsurgency as something normal, like controlling inflation, or abnormal, and therefore beyond the capacity of existing norms and institutions to handle. The event that prompts a great power to intervene in an internal war is either a normal part of international relations, or a mythic " day that changed everything," such as the storming of the Bastille, the arrival of Lenin at the Finland Station, or the fall of Salvador Allende. The good news about counterinsurgency is that there is a choice between the British and Stalinist alternatives. The bad news is, there is no middle ground between them. Max Weber described the state as the institution wielding the monopoly over the legitimate use of violence in a society. Without legitimacy behind the state itself, the only tool for squelching opposition is violence and intimidation at a massive, overwhelming scale. Still, anyone interested in counterinsurgency should take comfort in knowing that there is a way to defeat insurgents consistent with their own principles. While messianic fervor or the mission civilisatrice can take these principles to counterproductive extremes, a quiet but confident promotion of them can be the key to victory. No one is asking a great power like the United States to abandon its hard-won experiences with revolution and counter-revolution—in fact, quite the opposite. Anyone doubting the power of democratic principle need only look at the first great democracy, Athens, whose livelihood depended on a fragile sea lane that extended from the grain-producing regions of the Black Sea to the Greek peninsula. At any point along this route, including the narrow straits of the Bosporus and Hellespont, an enemy could choke off Athens' major food supply. Therefore, as Pericles tartly stated at the beginning of the Peloponnesian Wars, Athens' survival depended on maintaining an empire that protected the grain route. At the time, Pericles was primarily concerned about awakening his fellow Athenians to the cold realities of maintaining this empire, which might require the occasional threat or use of force to keep allies in line. However, Athens' empire equally depended on the appeal of the democratic ideal, of which Athens was the primary champion in the Greek world. Most outsiders understood and sympathized with Athens' arm-twisting to keep allies in line, as long as the violence stayed within reasonable limits. Athens gained many allies in the first place when democratic factions within Greek cities looked to Athens for help. The low point of Athenian power occurred during the oligarchic coup of 411, when Athens lost this political appeal. The oligarchs very nearly concluded a humiliating agreement with Sparta before they were removed in a counter-rebellion. While Athens ultimately lost the Peloponnesian War, the fact that it was able to endure for 27 years, dependent as it was on the fragile grain route, is as much a testament to the power of the democratic ideal as the quality of the Athenian navy. The oligarchic coup was not the only time a democracy lost faith in its own principles in the midst of war. France abandoned liberté, egalité and fraternité in Algeria, at great political and emotional cost, both in Algeria and France. French leaders failed to formulate anything like the British disengagement strategy in Malaya, in large part because the French regarded Algeria more as another department of France than a mere colony. Consequently, France waged a counterinsurgency war based predominantly on the power to imprison, torture, and kill rebellious Algerians. Not only did this strategy fail to maintain control over Algeria, but it also created a political crisis that was only settled with an overhaul of the French political system. Losing faith in your own principles is always tragic, whether it happens at a personal or a national level. Of course, Shakespeare's Macbeth applies to both levels simultaneously. At the urging of his infamous wife, Macbeth—by all reports, once a good man and loyal subject—seizes the throne by murdering the current king of Scotland, Duncan, while he is visiting Macbeth's castle. Thus begins a rapid descent into murder—of the king, his heirs, and even Macbeth's friend Banquo—insanity, paranoia, and civil war. Each crime, in turn, requires further crimes to deflect any possible opposition, until violence and oppression become ends in themselves. 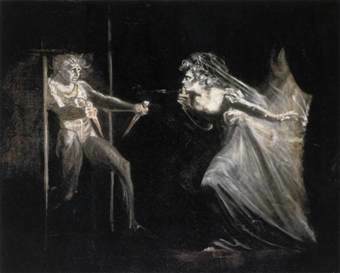 Having his discarded his moral compass, Macbeth searches for guidance and justification in the prophecies of the three Weird Sisters, who seem to tell him that he is destined for supreme power ("All hail Macbeth, that shall be King hereafter! "), has nothing to fear from any enemy ("[N]one of woman born/Shall harm Macbeth"), and will be safe in power ("Macbeth shall never be vanquish'd until/Great Birnam Wood to high Dunsinane Hill/Shall come against him"). However, Macbeth makes the common mistake of anyone who is too eager to seek justification in ambiguous intelligence, including the otherworldly variety. The witches' portents might just as easily have been read as warnings, if Macbeth had not raced to the conclusion he wanted to hear. Macbeth does become king, but the supposedly impossible vehicles of his downfall also occur. The army of Malcolm, a rival claimant for the throne, chops down trees in Birnam Wood to disguise their advance upon the strategic point of Dunsinane Hill. Macduff, the Scottish noble who cuts down Macbeth in battle, was "from his mother's womb untimely ripp'd." Abandoned by allies, surrounded by enemies, Macbeth is left with nothing but his own nihilism, writ large upon the Scottish throne. His famous "tomorrow and tomorrow" speech is the chilling outburst of someone for whom terror and violence have scoured away every other human quality. Shakespeare's Macbeth is one of the oldest and most convincing depictions of the nihilism behind oppression and terror. In Iraq, the United States has not prosecuted a war along the lines of the British approach. In fact, it has broken nearly all the basic rules of counterinsurgency. For example, no local civilian or military leader exercises control over all portions of American counterinsurgency strategy. The US government's attitude toward the insurgency—conflating all groups and labeling them as "terrorists"—cripples efforts to divide the insurgents and entice the least vile among them into a settlement with the government. The political facets of the war often seem missing altogether: US strategy has focused too much on fighting insurgents, and far too little at population control and political legitimacy beyond national elections. In fact, the Bush Administration's approach to creating a new government and holding elections has often proved to be counterproductive. Clearly, Iraqis support the idea of a new constitution and representative government. However, anyone with even a passing familiarity with recent Iraqi history could discern how important it was to grant the Iraqis greater control over their collective political destiny than the US government allowed. After the creation of Iraq as a reward to the Hashemite monarchy for its support in World War I, the Ba'athist coup, Hussein's consolidation of autocracy and terror, the war with Iran, Operation DESERT STORM, and the international sanctions that further crippled the economy, Iraqis in 2003 were momentarily elated by the prospect of finally having the power to decide their own collective future. Accounts of the occupation like Anthony Shadid's Night Draws Near and Larry Diamond's Squandered Victory depict how the Bush Administration's mishandling of the occupation—the indifference to political and economic reconstruction while the search for Hussein and phantom WMDs continued, the dissolving of the army, the exclusion of former Ba'ath Party members from government posts, the dictated terms for building a constitution and holding national elections—led many previously hopeful Iraqis to conclude that the Americans had no intention of granting Iraqis real self-determination. Meanwhile, two developments damaged the prospects for a British-style approach to counterinsurgency. First, American officials had little information on the insurgency, which led to a great deal of confusion over exactly whom they were fighting. While it was easy to focus on insurgent attacks, it was nearly impossible for US officials to gather effective information on the political messages of the insurgents—the real point of their attacks in the first place—their methods of organization and support, and the differences among groups. Second, US officials imported from Guantanamo Bay, Bagram Airfield, and other detention facilities a militarized, secretive, and coercive counterterrorism strategy that retrofitted to the Iraqi counterinsurgency campaign. Not only did confusion between counterinsurgency and counterterrorism create problems, but as I will argue in later posts, the Bush Administration's approach to counterterrorism was itself ineffective. If the American implements of counterinsurgency and counterterrorism have disturbing similarity to Stalin's network of secret prisons, indefinite imprisonment for political crimes, and torture, we should not be surprised. In counterinsurgency, there is no middle ground between the Stalinist and British approaches. If the aura of legitimacy cannot surround the exercise of force, then coercion must escalate until the unconvinced are completely silenced. 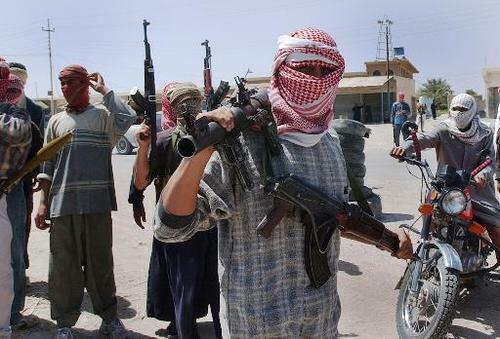 However, the United States lacks the power in Iraq to pursue this approach to its logical extreme. The United States is not sufficiently convincing as a liberator, nor frightening enough to be a conqueror. George Orwell once said, "People sleep peaceably in their beds at night only because rough men stand ready to do violence on their behalf." It's easy to take this quote out of context, if you don't also recognize that Orwell wrote 1984, the most famous attack on both communist and fascist. (Machiavelli often suffers the same misunderstanding, if you don't see The Prince alongside The Discourses, his treatise on republican government.) "Rough men" are always needed in war, including counterinsurgency. The important question, of course, is what principles guide or constrain their activities. Nearly every counterinsurgency war starts on a bad foot, so the situation in Iraq is not necessarily hopeless. The most dangerous enemy is our own ignorance or indifference to the problems we have created for ourselves. Macbeth's tragic flaw was not mere ambition, but the determination with which he pursued an increasingly murderous path to power. When he stopped long enough to justify the carnage, he used every tyrants' excuse, a combination of providence and necessity. You might be tempted to conclude that I am dressing George W. Bush in the costume of Macbeth. While we can see tragic tendencies in the current American leadership, including the timorous and feckless Democrats, George W. Bush is not our Macbeth. As long as the United States remains a democracy, the only Macbeth in the room is you and me. I disagree that the "Stalinist" approach is doomed to failure in the long run. It seemed to work very well for the Roman Empire in maintaining order for a long, long time. The British, too, despite their relative kindness in Malaysia, successfully used it in the Second Boer War. If you're willing to "make a wasteland and call it peace", to utterly destroy any population that resists being assimilated and then replace them with your own people, to commit genocide, then you certainly can hold territory by sheer force for a long, long time. In fact, it has broken nearly all the basic rules of counterinsurgency. Excellent thinking Sonny - the companies that incorporate that kind of synergy into their old and new media will definitely be the ones who get the most for their money! Thanks for weighing in! Hello friend, I am very much happy to see your blog. But the problem is I can't understand the language. Thanks for posting. All the best. No, wait. they are powerful. They have the right to urge people not to buy particular newspapers, they have the right to suggest legislation, they have the right to organise boycots etc. Air Retro Jordan Just as muslims do, except that muslims have very little power that way just yet since there are only a few million muslim immigrants and they're relatively poor. In the third, air jordan retro 1 I think that Wesley Clark’s recent analysis of how America defeated the Soviet Union is on the mark,and that we will have to continue to push the contradictions on the various parties that are still entranced by the Marxist fallacies.nike basketball shoes retro This requires engagement with Russia and the former Warsaw pact nations to keep Russia on track and to try to minimize backsliding in parts of the old SU. jordan shoes retro We need to work China off against North Korea, and we will at some point need to deal with Castro and his few remaining Western friends.